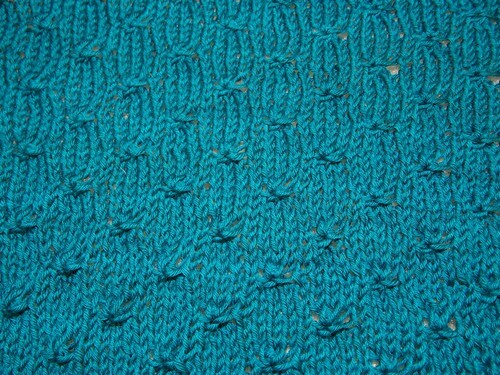 I'm starting the ruffle edge on my July Knit Something of the Month Project! I didn't try to get a picture of the whole thing since it's just packed together on my needles, but I thought I'd show you a detail shot of the stitch texture. I think this design would look great in a heavier weight of yarn for a Winter shawl/scarf (it's one of those long, more narrow things that are wider than a scarf but not as wide as a stole, that you can wear either way). Even though I've got until the end of the month on this, I'm trying to get this finished before Friday so I don't have to worry about it during the Ravellenic Games. I've got fewer than 15 rows and a bind off to go. I'm not sure how much blocking this will need since there isn't any lace in this project.